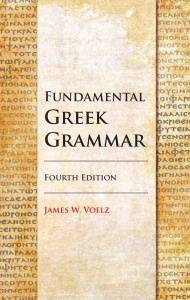 The first edition of Fundamental Greek Grammar was released in 1986. What made you first decide to write a Greek grammar book? The same thing that drives every author to write his own Greek text, viz., dissatisfaction with what is available. In the middle 1980s the standard text was that of J. Gresham Machen (which is still in use!). This book has three great defects, which I sought to correct: it did not contain New Testament passages, its practice sentences were both poorly formulated and poorly arranged, and it did not introduce enough material (i.e., it was too elementary). I sought to correct especially these problems. How does Fundamental Greek Grammar differ from other books on the market? FGG corrects the problems detailed above, with practice sentences arranged from easy to hard, and with Bible passages selected to illustrate the main points of each chapter. In addition, it seeks to explain fairly comprehensively features of the Greek language, especially the Greek verbal system, in simple and straightforward terms, comparing such features to those of the English language. The fourth edition also enables teachers to improve their students’ use of English, via the addition of an English review component. What can students expect from this new 4th edition? The 4th edition corrects a number of errors of the 3rd revised edition, improves a number of explanations, and adds new biblical passages in several chapters. No doubt more significant, it contains “English Review for Greek,” a short composition that seeks to review English for beginning Greeks students, to enable them to improve their grasp of basic linguistic categories as they seek to acquire another language. Have you had to adapt your method of teaching Greek over the years as new generations of students have entered your classroom? I have changed rather radically, though not because of a new generation of students. I have gone to a “flipped classroom” method, which requires students to view a video of the presentation of the new chapter outside of class, thus allowing all class time to be devoted to discussion, to answering questions, and to expanding upon basic material. I am very pleased with the results. What would you say is the hardest concept for students to grasp as they learn the Greek language? Especially if they have not encountered a foreign language before, it is difficult for students to get the idea of “inflection,” i.e., that different forms indicate a word’s function in a sentence. To take an analogy from English, “he,” “his,” and “him” are not three different words but three different forms of the masculine singular personal pronoun that indicate three different functions (the first for the subject of a sentence, the second to show possession, and the third to express the object of a verb). In Greek, unlike English, all nouns, pronouns, and adjectives are inflected. This means that word order is much more flexible but also that there are many more forms to learn. What is your favorite Greek word and why? I don’t know if I have a “favorite,” but I am partial to the verb ἵστημι, which is the third most frequent root in the New Testament and can be used both transitively and intransitively (see “English Review for Greek” for these two linguistic categories!). Why should those entering full-time church work study Greek? What is the advantage when there are numerous commentaries and computer programs that deal with the biblical languages? Think of it: If you were going to devote your life to Shakespeare and his works, would you do your study in German or Spanish? Would you not learn English? To read the Scriptures only in translation is analogous to watching a football game on a 12” black-and-white television rather than going to the game. Don’t you want actually to be at the game, rather than watch a little box? At the game you can see details that are not visible on television. You can experience the hitting, the confrontations. You can truly appreciate the speed and shiftiness of the wide receivers, as well as the small windows of opportunity that a quarterback is called to throw into. You can feel momentum shift. When studying Scripture, none of this is possible using only an English translation or only commentaries that are, finally, the opinions of other people. And computers tend to treat a biblical text basically as code, rather than, as it is, a literary masterpiece with inspiring composition and an impact (= pragmatics) that can be felt only by a live human interpreter. 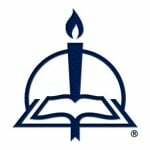 Why would a layperson find knowledge of Greek an aid to Bible study? For the answer to this question see the first eight lines of the answer to the previous question, which also applies to laymen and women. Consider Bud Newberry, a member of my Bible class at St. Paul’s Lutheran Church, Des Peres, MO. He took Greek as a MacDonnell-Douglas retiree, at age 60 or so, and he has kept up his Greek to this day, using it regularly at Bible class. It is a blessing to him and to the class. Rev. Dr. James W. Voelz (PhD, Cambridge University) is well-acquainted with contemporary linguistic theory and, as co-chair of the seminar “The Greek of the New Testament” in the international New Testament Society (SNTS), keeps abreast of developments in the study of the Greek language. 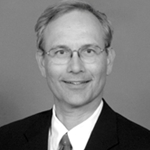 Currently Chair and Professor of Exegetical Theology (New Testament) at Concordia Seminary, St. Louis, Dr. Voelz has taught elementary Greek at the seminary level for 38 years. He is also the author of Mark 1:1–8:26 in the Concordia Commentary series and What Does This Mean? Principles of Biblical Interpretation in the Post-Modern World.